The infamous "Rorschach Test" is was just a drop of ink pressed between two sides of a folded paper. But the 47 tests that follow have been updated for the mighty year 2010—taken with cameras, rarely utilizing ink. I took this photo of a tree against the sky in a graveyard in Winchester in England. I used a Canon Eos 550d on ISO 100, f/5.6 shutter speed 1/160. I was looking for a fall photo, but most of trees were still green so I got this instead. I think that I can see the head of a demon bull in the image. Does that make me crazy? For this challenge I used my MacBook Pro screen as the background (i.e., display a Keynote presentation with one white slide and the screen in full brightness). As far as the inspiration, I knew I wanted to use household items for this one (getting the silhouette outdoors was too hard for me in "not-so-sunny" Boston a few weeks ago...). After trying some translucent options (water, sauces, cotton, paper, plastic wrap, etc.) I started playing with the cotton swabs and tried different shapes and forms... 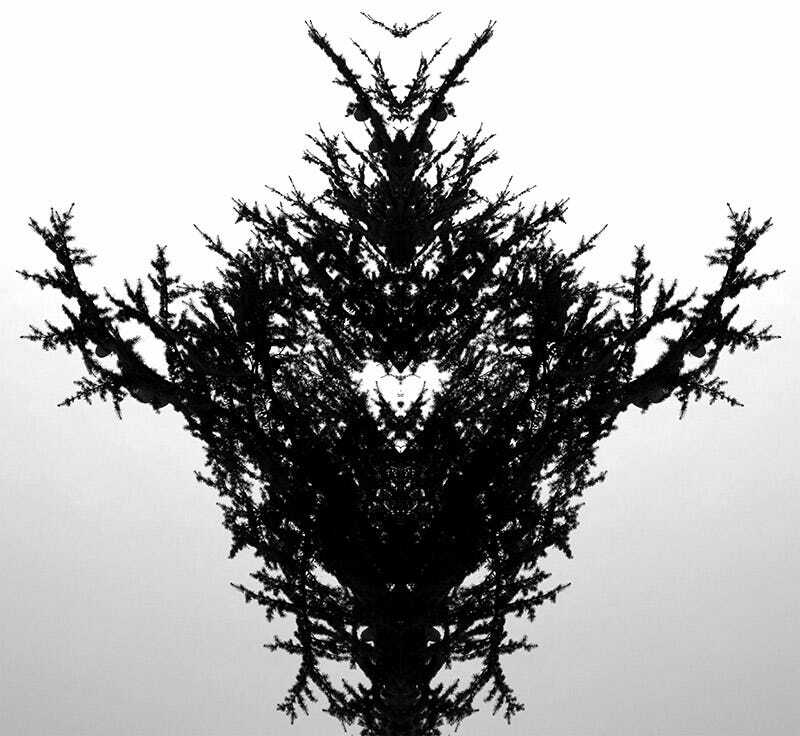 Ultimately decided on this "butterfly" picture since it seemed the most Rorschach-ish to me. Canon T2i, Shutter Speed 150, Ap f/4.5, ISO 100. I used dried, crushed up green tea leaves for the design. I put them on a clear plastic tray and shot down on it with an off-camera flash lighting up the floor (which was acting as the background). I would simply shake up the tray after each shot to produce new images. This one was easily the best design of the bunch. Rebel T1i with ef-s 55-250mm lens. Lumopro lp160 flash. 1/200, f5.0, ISO 100.
and Gary Fong Lightsphere @ f2.8, 1/200, ISO 200. The image started out as a bare tree with an osprey nest in it. The sky was completely clear. of The shot was deliberately over exposed to wash out the color. The shot was framed so that it only required a simple rectangular crop to remove all the unwanted elements. The trickiest part was lining everything up and still finding a way to shield the camera from the noonday sun. GIMP was used for the crop, desaturation to remove the remaining color, an unsharp mask pass, mirroring the image, and aligning the two halves of the image. Fujifilm s100fs / F5.0 / 1/500" / ISO 400 / 8.7mm fl, GIMP for post production. While this is the first shooting challenge I have actually entered, it is not the first that has worked my brain into a frenzy, attempting to come up with something worthy of Giz. I thought for nearly a week on differing mediums that would lend themselves to this challenge. My son's silhouette, paint, even chocolate sauce ran through my mind, but finally, I hit upon it...ground coffee. This photo was taken on a background of freezer paper, on my dining room floor, complete with drum serenade/practice from my hubby. (Thanks Babe! : ) ) I played with the coffee for about 5 minutes, reminding me of the sand painting videos on you tube and commercials. Very cool, although the strong, strong smell of coffee lasted in my nostrils for quite a while. (Yes, it's late, yes, I am still very awake!) I used the iPhone 4 the hubster bought for me back in August, (again, thanks Babe! ), then used a combination of my photoshop express app and Photoshop on our MacBook. The whole process of flipping, resizing and saving was all new to me and was very rewarding to learn! I made two other images, but one looked like The Tick, and the other like a One-Up mushroom/lotus flower love child. This one won our hearts for it's pure Rorschachyness. (It's a technical term ; ) ) Thanks for looking! On the side of the road, I found this rusty, old chassis from some electronic doodad that had been run over and flattened. I photographed it backlit, then used Photoshop to mirror the image, adjust the contrast, etc. Nikon D70s with 60mm Micro-Nikkor, ISO 400, 1/125sec @ f/22. I live is florida and nestled in the crevice of tree branches are these squiggly air plants. I shot the plant against a beautiful blue sky. In photoshop I first desaturated only the blue channel to get the white background, then I desaturated the entire image to produce a b&w subject. Shot handheld with my Canon 20D, fixed 200mm @ ISO 100, f/5.6, 1/125. Extremely fun and innovative shots this week from everyone. Make sure to see the full gallery below and download wallpaper-sized photos on flickr. In the meantime, I'm off to find a good psychiatrist. If you like Shooting Challenges, you may also like my new photography site: Life, Panoramic. Today, we posted a graffiti tour of San Francisco's Mission District.